Award-winning war photographer Danfung Dennis had no intention of making a film when he embedded himself with troops in Afghanistan in 2009. Accredited as a New York Times photographer, Dennis dropped down in the war zone with body armor, a backpack and a camera to capture the battle from the front of the line. 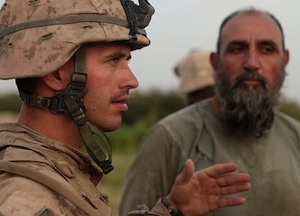 Cut to two years later and he’s a first time filmmaker thanks to his award-winning documentary, “Hell and Back Again.” The film was born out of Dennis’ chance meeting with Sergeant Nathan Harris on the battlefield. Six months after first meeting, Harris was shot in the hip during an assault on a Taliban stronghold and was sent home to recover. Dennis rejoined the injured soldier in his hometown of Yadkinville, North Carolina and went about chronicling Harris’ rehabilitation process. How did this whole film came about? I didn’t have any intention to make a film. I knew that this operation in July, 2009 was the largest air assault since Vietnam. I knew it could swing the war in either direction. So I knew I had to cover it, and I asked to be embedded with the company. Shortly after landing, we were surrounded on all sides and attacked. On our first day, one Marine died and several collapsed out of exhaustion. The fighting focused on this rubble that became known as Machine Gun Hill. This is where I first met Nathan. We had all run out of water so he handed me his and lent it to me. So I followed his platoon as he pushed further into the stronghold. That’s when I really got to know him. He learned to trust me and I trusted him. It was because of that trust that I was able to follow him in North Carolina where he was transitioning back into society with both physical and psychological issues. Were you back home in New York when you learned of his injuries or were you still embedded with the troops at the time? I was in North Carolina when the entire company was returning. They’d just finished their deployment, and were stepping off the buses. I didn’t see him – I asked where he was. I was told he got hit and got back a couple of weeks ago. So I got his number, hit him up and he invited me up to his hometown. He was still in tremendous pain, feeling guilty for getting injured and leaving his men, which is a very common feeling to have when you leave these situations even though it’s completely not your fault. So he was in this very difficult stage of recovering and also of reintegrating into a society that had no connection to what he had just experienced. I had felt that same kind of isolation having left war, so we leaned on each other. I essentially lived with him and his wife Ashely and documented their every day. When did it hit you that you had to document his recovery and make the film about that? When I learned that he got hurt. I had to just follow him. But you had done nothing like this before. No, it was my first film. I’d mostly been working in conflict zones. I thought it was going to be some kind of big picture piece on where the war was at. But as the experience unfolded with my own experience of coming home, I realized that war isn’t simply about what happens on the battlefield, it’s also about what happens on the home front. The war doesn’t stop when these men return. Nathan knew that I had a lot of footage of him in the field, so he was willing to open up and share this much more personal, psychological experience of what it’s like to come home. He was adamant when a local news crew came that he didn’t want anything filmed from the shoulders down. He didn’t know them. He was being called a hero. Most of these guys don’t feel like that. They feel like they’re doing a job. The heroes are the ones who don’t come back in their eyes. I knew that I wanted to merge those two experiences of going to war and coming home into one single experience. Speaking of…You structure the film almost like a fictional narrative by inserting battlefield flashbacks for dramatic effect. Much of the film’s power comes from the way you deftly weave the past and present together. How did you navigate that? You had no way of knowing what Nathan was feeling at every moment of every day. I never sat down with Nathan to ask, “Is this what you were thinking at this moment?” I think I had to go through a lot of these things myself, that disorientation, that emotional numbness that comes with leaving a world of life and death and coming back to a world that seems mundane and superficial. I had to think a lot about how war is represented. I think there’s this common ancient myth that war is this heroic, romantic endeavor. That’s how it’s most often represented. And I think I fell into that myth when I first started. I was making images to match that image of war that I was indoctrinated with through society and media. I felt to give an honest portrayal of war, I had to show that transition back home and merge it with what I shot back there. It’s really just one battle.